Provides a very simple and cost-effective solution for capturing lectures, presentations, medical procedures, seminars, and training sessions in high-definition 1080p. Use standalone or as part of a complete CaptureLiveHD system. The CaptureLiveHD system from Crestron answers the call for a high-quality meeting and lecture capture solution that's simple enough for the entire faculty to use, and affordable enough for wide-scale deployment across any sized campus or corporate enterprise. CaptureLiveHD delivers a complete end-to-end solution for scheduling, recording, and online delivery of captured content at the lowest cost of ownership on the market. Flexible enough to fit any education, government, medical or corporate work-flow model, CaptureLiveHD translates to greater usage of resources and a more effective education experience while minimis part of a complete CaptureLiveHD system, the Capture HD High-Definition Capture Recorder (CAPTURE-HD) provides a very simple, one-box component for capturing lectures, presentations, medical procedures, seminars, and training sessions. It is designed for easy integration in a classroom, lecture hall, training lab, or boardroom. It allows presenters and instructors to use their choice of multimedia sources, including high-definition videos, computers, whiteboards, and annotators. The CAPTURE-HD base model provides HDMI and RGBHV inputs for such sources, plus a composite video input for a camera and line-level audio input for a wireless mic. The CAPTURE-HD-PRO model adds a 3G-SDI input to support HD digital cameras. Without requiring any special training or extra effort from the presenter, the CAPTURE-HD records the complete presentation in full-motion HD 1080p or 720p and uploads it to a network server for publishing. It can also stream live video to a touch screen, computer, mobile device, DigitalMedia system, or third-party streaming media system. Schools and businesses may easily implement a facility-wide media capture solution by equipping every room with CAPTURE-HD recorders, all centrally managed by Crestron Fusion RV Remote Asset Management Software. The CAPTURE-HD recorder is a compact unit, designed to sit on a shelf or mount in an equipment rack or podium. It captures presentation content from a computer or other source along with a live camera image and records them together in full-motion HD. The two images may be composited on screen side-by-side or picture-in-picture (PIP). The camera PIP window can be sized and positioned in any corner of the screen over the presentation content. Either image may be captured full screen as well. Audio content from the presentation source is captured in stereo along with the live "speech" signal from a wireless microphone. The two signals are mixed together and recorded as one high-quality stereo signal. Front Panel Intuitive controls are provided on the front panel for starting, pausing, and stopping a recording. Each button lights up in a different color to provide clear indication of recording status. An LED bargraph meter provides indication of the speech signal level so you'll know that you're being picked up loud and clear. A full-color LCD screen displays additional feedback and provides access to setup functions. Content Inputs Connecting a computer, DVD player, or other presentation source is enabled via HDMI and RGBHV inputs on the rear panel. The HDMI input handles high-definition digital AV devices and computers with stereo audio. The RGBHV input handles analog computer sources. Built-in scaling ensures compatibility with a full range of signals. A stereo analog audio input is also provided. Camera Input A composite video input provides for the connection of a single camera or switcher. Crestron offers two cameras ideally suited for the application, the CAM-IFB-100 and CAM-IPTZ-101. A 3G-SDI input (CAPTURE-HD-PRO model only) is also offered, allowing for the use of a high-definition camera with SDI, HD-SDI, or 3G-SDI output. Speech Input A wireless microphone or mic mixer can be connected for pickup of the presenter and other individuals speaking. 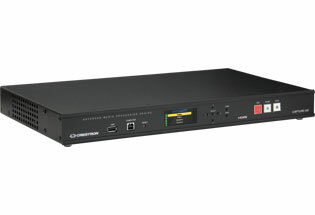 Crestron FreeSpeech wireless microphones (MP-FS100_PAK or MP-FS200_PAK) offer an ideal speech pickup solution. Local Output HDMI and analog audio outputs are included for connection to a confidence monitor or AV system. These outputs may be used to view and hear exactly what is being recorded, or to pass the selected content source through for local presentation. File Storage Captured AV files are stored locally on a memory card or USB hard drive prior to uploading to the network. A memory card slot and USB port are provided on the rear panel, and a 16 GB SDHC memory card is included. An additional USB port is provided on the front panel, allowing recordings to be saved directly to a portable USB hard drive. Live Streaming As an alternative to capturing video, the CAPTURE-HD can also be used to stream live HD video and audio to a computer, mobile device, touch screen, DigitalMedia system, or third-party streaming media system. The CAPTURE-HD supports both unicast and multicast, with or without RTSP (Real Time Streaming Protocol). Streaming connections can be configured to stream directly to one or more specific IP addresses, or to use RTSP to manage the configuration of multiple connections automatically. Gigabit Ethernet Connection to the LAN is via 1000Base-T Ethernet, affording the highest possible transfer rate for uploading HD media files to your network server or streaming live video. Adding the optional touch screen controller (CAPTURE-TPMC-4SM) enables simplified operation of the CAPTURE-HD from a lectern, desk, or wall mount location in the room. The presenter need only follow the prompts on the touch screen to easily start and stop a recording, pause or mute the recording and even add bookmarks during the session. The touch screen can also display a live view of the room camera and a microphone level meter to lend an extra level of confidence during operation. The CAPTURE-HD integrates seamlessly with a Crestron control system to enable expanded control over AV and room devices using a variety of touch screens, wireless remotes, computers, and mobile deviceszing support overhead.